language barrier, and the fact that there was no one to share anything about these sightings. happen to present day. In short, I'd like to call it "The Troyan UFO phenomenon". i didn't realise it was you!. yes, i do remember your very interesting and detailed story from ats. i think although you were a bit weary of my posting, you came to understand my style of scepticism and why i am that way. im glad you have joined us here as you engaged me in some good discussion on ats even though we have different views. the borders of this small country. below aren't a good enough indication of the beauty of this place... They are all from the area around Beklemeto peak, by the way. the river bank of the river Osum. radio astronomers, in a worldwide scale. resemblence with a pair of those. Last edited by ch1n1t0 on Thu Feb 10, 2011 4:51 am, edited 1 time in total. Also, I don't think our views differ at all (especially after reading your welcome thread), I too am very skeptical regarding all of the fish that swim in the ocean of information we call Internet. So I completely understand your stance regarding this, as it would've been the stance that I would originally take if I weren't on the witness side. However, do look into the information presented in the following post, as it will hold some new information towards the subject we'll be discussing here. Last edited by ch1n1t0 on Thu Feb 10, 2011 4:53 am, edited 1 time in total. the evening of 24th April, the second time was on 27th of April, when the same strange lights were observed and this time, video footage was taken. to the arguement of the talkshow being a watched and influential one. photo footage, and although that's not the originals, it will have to do for now. so I could get these to be discussed here, hopefully he will trust me with them. Last edited by ch1n1t0 on Wed Feb 09, 2011 9:00 pm, edited 1 time in total. cool, im looking forward to reading it, keep up the good work. Dipartimento di Fisica, Universit´a di Perugia, Via A. Pascoli, Perugia, Italy. This person is specialized in the study of EQLs (Earthquake Lights). luminous and other non-common phenomena in this region. You should definitely check if the observations are related to seismic activities in this region and if local astronomers have recorded non-conventionnal events with their allsky cams. He is in charge of an initiative in Italy in an area of the Tuscan-Emilian between Montefiorino, Lake Saint and the Stone of Bismantova were non-conventionnal atmospherical events seem to happen. Cheers and thanks for your report. I will now continue with the second piece of information regarding the UFO sightings happening in the Troyan region. As it is a personal experience, what better way to get you to understand my sighting to the fullest, than to present some stuff about me and my views towards UFOs prior to the event. Before the sighting in August 2010, I wasn't interested in the UFO phenomenon that much. Like most people, I did enjoy most of the X-Files series (apart from the seasons with Robert Patrick, mho), and as a self-respected thinker about things in life, I've been thinking about aliens, but never have I gotten too much into it. All in all, my experience was based on movies, information on the web, and a few personal stories I have heard throughout my life. And being aware of the ocean of information the World Web is, I always remained skeptical towards video and photo proof. However, I am a good example of why sometimes ignorance is a bliss. If one asked me before my sighting whether I believe we're being visited I would've answered "Most probably Yes" and I wouldn't give it too much of a thought. Also, if I was asked back then in case I see a UFO from closeby will I try to get close to it, I would've answered with excitement "Yes". Well, after I confronted directly (or probably better put, was confronted by) the UFO phenomenon, these two answers changed - first of all, one of the results from that August night was me getting indepth with this subject, wanting to know what we saw. Which led me to digging much deeper and finding much info on UFOs. And in place of getting answers, I now have more questions than I had in the beginning, and I have greater doubt than ever, about we being visited. It's so confusing it's almost annoying at times. If you ask me, the odds of us being visitted are around 50-50, and I can't make up my mind just yet, the reason why I continue digging and researching this further. But this doesn't mean that something bizzare is happening in our skies. Basing my opinion on my sighting, I can assure you there is advanced technology flying above us. As to who is operating those, I don't dare speculate about it anymore, hope that will change with future evolvement. Last edited by ch1n1t0 on Thu Feb 10, 2011 5:01 am, edited 1 time in total. This sighting is my first, and I am not sure if there has ever been such an event reported anywhere before, both in intensity and in duration of observation. Thus, the detail of the sighting. 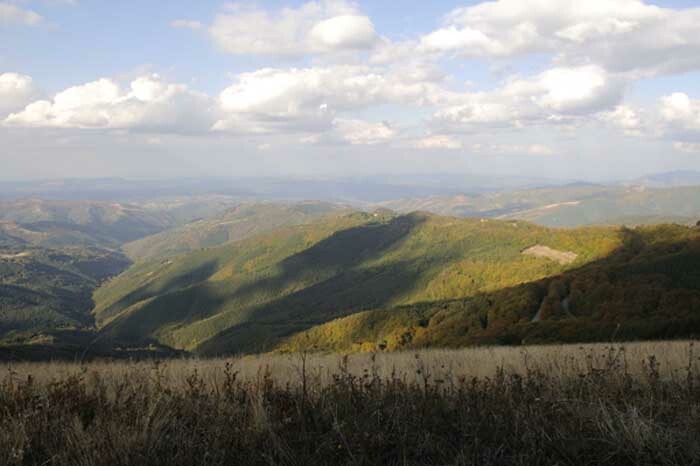 Planina, right where the Troyan-Kurnare passage road lies, which is one of the main passages connecting the Northern and Southern parts of Bulgaria. At the highest point of that passage there (1565 meters above sea level) is a big monument from the communism times before 1989 in Bulgaria, it is called Beklemeto. 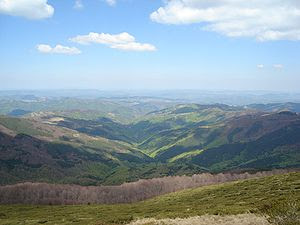 The closest town is Troyan, from the Northern side, it's about 15 kilometers from Beklemeto. Also, close to the monument, around 30 minutes on foot from our camp there is a small group of hotels. I met my friend up in the mountain, he came from Southern Bulgaria, and I travelled from the capitol city Sofia to the place from the Northern side of the mountain. We met there at around 12 o'clock at noon, then we walked a few of kilometers from Beklemeto taking a dirt road towards East (we had no vehicle, we both travelled by hitch-hiking) and after awhile we reached a good place for camping (it's quite windy because we were on the highest point of the mountain in the region and strong winds are not something rare there). The exact coordinates of where we put our tent are: 42°46'20.73"N 24°39'7.46"E facing North-East, the view is towards the Northern part of Bulgaria (I got the exact coordinates thanks to Google Earth). Also there were no trees on our altitude, forests were lower than us, the closest being about a kilometer away. for a few hours, I woke up at around 10:30 PM. I went out of the tent, me and my friend sat and talked for about an hour. The fog of clouds from earlier was now completely gone and as it was New Moon, we could observe a breath-taking view of the Milky Way and also the Perseida meteor showers which was originally the idea of our trip to the mountains. we observed the light flying really slowly without changing direction we started guessing what it could be. The light wasn't flashing at first, it also didn't make any sudden changes in direction the first five minutes or so. Not until it decided to suddenly change its direction to the exactly opposite. Some seconds after that, really close to the first object, another one appeared from nothing and both started an amazing series of flashing (which I guess was how they communicated) and flying in the sky. And I'm talking about some serious mind blowing manouvers, that I personally can't assign to any known (or even kept as a secret) human aircraft or natural phenomenon. That's when we realised something out of the ordinary was happening. The lights were making sudden changes of direction, sometimes they faded away for a couple of seconds, just to get brighter afterwards, it was more than obvious they were communicating to each other. And then we started looking at various regions of the night sky to look for more objects and it didn't take more than a minute - that's when we realised it - these objects were all over the place, they just didn't caught our attention at first. We have no idea how many we've observed throughout the night, however, at a certain moment we managed to count 25 different objects being present at the same time on the night sky. All of them were behaving as nothing known to or being produced by man. We didn't manage to see more details regarding these particular lights, as they were some kilometers away from us, and were simply everywhere we looked.After probably an hour of observation of these lights, we saw something that gave us a chill to the bone. We looked to the East and that's when we saw just above the closest hill, really close to the ground, a white light hovering over what appeared at first 10-15 meters above the surface of the hill. In the beginning we could only see that light, however, after thirty or so seconds of staring we could very well distinguish its shape - it was flat disc shaped, it had a bright constant light in its center (the one that caught our attention at first), around the edge of the disc there was a ring of red light, slowly pulsating (it was much dimmer than the central light), and because there was no moonlight, we couldn't see the body of the craft in detail, however, when looking carefully, we could depict the flat and round shape of the object by being much darker than the sky behind it. The most interesting thing about this particular object was the way it was moving - first of all, when realising the object was disc-shaped, we understood that the lowest part of it actually was no higher than 2-3 meters from the top of the hill it was hovering above. That's because the position of the disc was not horizontal, as in most cases, but it was vertical according to the ground. The most amazing part about it was that while moving horizontally over the hill, the object was slowly rotating having it's center being the center of the rotation, and it wasn't rotating in one specific direction only, but it was changing the direction constantly. continued hovering, and not more than 2 minutes later, something flickering in the top of my eyesight caught my attention. It was a small white light looking almost like a star, but it continued getting brighter and brighter. The light was constant, not flashing, only slowly getting brighter and larger and then again to its original state. Also, from time to time every 10-15 seconds it vibrated very strangely - it rapidly moved from left to right for a tiny fraction of the second. The distance between the most left and most right points of its movement when it vibrated was around 4-5 centimeters in my eyesight, so, taking in consideration it was away from us for some distance (although we can't be exact as only a light was visible and no obvious body of a craft) it moved amazingly rapidly... And this is the only object we managed to get on photo - both me and my friend only had telephones with weak cameras and only because of its brightness did it came visible on the photo, unlike the other dimmer lights in the sky. A little bit later, we saw a second easily distinguishable in shape and design object. First, it appeared as a small, pale dot, that was right above the disc shaped. My assumption is that it was at least a kilometer above the disc. It was really strange, as this pale red dot copied perfectly the movement of the disc on the horizontal, it seemed as if it was one whole object. It continued doing so for about 10 minutes, when it suddenly stopped (while the disc just continued whatever it was doing over the hill), hung in the night sky for some seconds, and then started moving. It flew directly West, meaning it actually passed right in front of us, not more than 200 meters away, at about 45 degrees according to our point of view just to disappear in the distance. As it passed, we could very well see that it was a flat triangular shape, with a bright white light at its center, and three red lights in the angles. Again, it wasn't as typical sightings describe these as horizontally positioned, this one was vertical and was flying in horizontal direction meaning it had no problem at all with the forces of air resistance. The greatest thing about this object is that we could really clearly see a very specific characteristic about its way of movement - on equal intervals (I measured them to be around 5 seconds) the triangle simply rotated on 90 degrees around its center, changing the positions only of its angles, as the center light being stationary, and this rotation occured just in the matter of tenth of a second, continuesly, as the object was flying away from us until it disappeared. The last object that was showing specific characteristics and was visible enough to make out details, was at almost our altitude. It appeared at around 4:00-4:30. It looked like a disc again, but we couldn't make out a body of the craft, so we're not completely sure. What we could see were 5 lights (not separate, definately connected to each other making one whole object). They were one next to another, and made the object appear as horizontally positioned. What was kind of scary was that it was hovering right above the hotels I mentioned in the beginning, but we didn't see something more than that. It all ended at around 5:30 AM in the morning, when out of nowhere, clouds appeared and again covered everything. We went in the tent and at that time with the fog outside, although we were very scared, we somehow fell asleep. We slept until 7 o'clock, and when we got up, there was no sign of the objects. None of the objects produced any kind of sound. Completely silent! Neither me, nor my friend felt anything strange during the sighting, except for the adreanaline rush the first 2-3 hours, we wanting so much to communicate with them, shouting from time to time in excitement, yet baffled what on Earth were these things, considering and discussing the possibility they were man-made, what they were doing there etc. After we calmed down little by little, we started thinking rationally, and I personally got scared because I didn't know what their intentions were, and I trully felt the harsh reality of me and my friend being all alone there in the mountain, in front of our tent surrounded by tens of these lights. A smashing feeling, that is, of being so ridiculously small and defenseless. On 11th of August in the morning when we woke up, everything has changed, I was so stressed from the experience that I didn't want to talk about it for at least a week. I only told the people closest to me with very little detail, at first. We didn't even feel an urge to go to the hill the disc shaped object was hovering above to see if there were any signs left. All I was thinking about is how I was going to get home and not go outside for awhile. Also, another important detail is that the whole mountain was echoing of shepperd dogs barking. Don't get me wrong, I've been wondering about UFOs and ET life for some time, much before this event happened. I was an enthusiast who up to that point had no personal experience on the topic, only observations and theories. And being as open-minded as I consider myself to be, I have no idea why this has stressed me so much, all I know that my view of everything has become completely different since then. It took me 2 months to fully overcome the stress from the event and to gather will to sit down and make this story reach other people. Also, since then, I haven't felt any need to convince anyone who has heard and not believed this story and I still don't. From what I saw I simply believe we're not that far from the moment this phenomenon will become publically acknowledged by everyone. Something I think is important as well - after a week passed after the event and I started doing research, I found out that every fifth citizen of Troyan claims to have seen such lights in the distance towards the peaks of the mountain. NOTE regarding the photos - I'm uploading three photos, two are originals and the third is the one of the two photos but after some enhancing a friend of mine did on it. Bear in mind that this is a photo taken by a phone camera towards the night sky - it was new moon and the whole Milky Way was visible, and yet no stars appeared on the original photo, well, not until it was edited and brightened. The reason for me to say this is to take in consideration that fact, because it will help when trying to find out how much brighter the object was in the sky than the stars. As for the reddish areas that appear on the enhanced photo, some of these are most likely camera artifacts, and the small dots of light are showing exactly how the phone camera managed to photograph the stars in the night sky in comparison to the bright object. I managed to draw and write a bit on top of two screenshots I took using Google Earth (sorry for the lousy quality of drawing, used MS Paint there and was limited). These were taken from positioning the camera at the coordinates that I provided. If you take a look in there, you will see the same things. I didn't include shots of other directions as there were lights appearing in most places either way, I included only the directions at which I had GOOD observation. And by no-good observations I mean white lights hovering, manouvering and blinking without giving away how they looked and most acted the same. Basically, the first type we saw that night, although it could've been any of the other four because all that was visible was a white light and nothing more to it. These lights were always up to 20 present at the same time, while the others which I've given detailed explanation about gradually appeared through the night. Note that I've added a little detail that I could recall while drawing on these screens, something I didn't include in the report cos simply forgot to mention. And this doesn't mean that all came from North-East. I'm positive however, that the triangular one went directly West and disappeared in the distance. - both our, and their sighting occured in the days when moon phase was New Moon, and another one (from 2009) happened a couple of days after New Moon. - the fact that we can hear dogs barking in the video from 2009, and in 2010 we also heard dogs barking like mad throughout the whole mountain. - the movement of lights in the distance in the sighting from 2009 is very similar, if not 100% identical to the patterns we managed to observe in 2010. - there is a fact that I missed mentioning regarding the video excerpt from the talk show - it was uploaded at vbox7.com, which is a sort of our local Bulgarian YouTube. The title from the uploader was "Some crazy dude with UFOs", so you get the idea how the average Joe around here treats the subject. What's more important, however, is that there were many comments from people who said they were from Troyan and this has happened many times before, and that the guy was not crazy at all, some also stated to be his students from the School of Art and said that he's quite decent as a person, and a teacher. There was even a comment saying "If you go for a few days in a row on top of peak Kapincho (which is in the outskirts of Troyan) and stay there for a couple of hours, you will see these for yourself". The reason I included the last arguement, is that it led me to believe that this phenomenon indeed is not a rarity in the region. I think I will be able to get this confirmed with a couple of interviews with locals in the area. As I said, I will also try and get my hands on the originals from the teacher, and I believe he will be willing to share them with me, since I will tell him my story as well. I'm planning on going back to Troyan in a few days, not more than 10, so you guys have plenty of time for suggestions regarding a questionaire that'll include the most important questions the answers of which, could bring us closer to solving these bizzare cases. Thank you so much for your input, Buck. I will contact the people you mentioned, simply because your post rang like a bell in my head. I am 100% positive that just a couple of days after our sighting there were at least 3-4 minor earthquakes in Bulgaria, and 2-3 mid that all happened in 2 days. I admit I made a connection between the two, and it got me worried a bit. However, it is strange, since Bulgaria is a small country, and we don't get that many earthquakes per month. They also talked about this being out of the normal on the news but they reassured that it's nothing to worry about. I'm not saying that these are connected, but after your post, it brought this possibility back in the game for me. So I'll go ahead and contact the people, and we'll see where that gets us. 2006/2007, the US military has been building up a significant presence in your country. Under the deal, U.S. troops will be able to use three Bulgarian military bases - the Novo Selo training area and the Bezmer air base in southeastern Bulgaria, as well as at the Graf Ignatievo airfield in central Bulgaria. However, not all Americans support this new move by the US government. Doug Bandow of Campaign for Liberty, a former Special Assistant to President Ronald Reagan and an Editor for the Inquiry magazine, recently pegged the questions, “Why is the US building unnecessary facilities in countries which the U.S. has no need to defend? Is there anything for which the American people are not expected to pay?" Do you know if this location is anywhere near any of those bases? Particularly the Bezmer air base or the Graf Ignatievo airfield? This is also pretty interesting considering the US presence there is related to anti-ballistic missile technologies/testing. "While ballistic missiles like the one ALTB destroyed move at speeds of about 4,000 miles per hour (mph), they are no match for a super-heated, high-energy laser beam racing towards it at 670 million mph," a Northrop Grumman official says of the landmark event. "The basketball-sized beam was focused on the foreign military asset, as the missile is called officially, for only a few seconds before a stress fracture developed, causing the target to catastrophically split into multiple pieces." During the tests, Paveway II Plus systems were launched from altitudes ranging from 10,000 to 30,000 feet against a 24-by-24-foot billboard target at a 45-degree angle. "Two [Guided Bomb Unit] GBU-10s and four GBU-12s equipped with MAU-209C/B computer control groups were released from a pair of F-16D Viper jet aircraft from Eglin’s 40th Flight Test Squadron," explains a Lockheed Martin spokesperson. "Each initiated laser acquisition at the expected time and guided to the intended target." Paveway II laser-guided bomb guidance kits increase weapon accuracy, reducing risk to U.S. and allied ground forces by converting gravity weapons into precision-guided munitions. A computer control group serves as the LGBs front-end guidance system, while an air foil group with stability fins on the back of each weapon delivers lift and aerodynamic stability for in-flight maneuvering. I bet watching some of the advanced tests would probably be a phenomenal experience, particularly at night?